During the early 70s I was just old enough to appreciate progressive rock. Arguably Genesis, Yes, Hawkwind, ELP and the rest were at their best and once the Punk era arrived I preferred the 3 minute thrash and bash to the 10 minute or more musical sagas of the prog rock supergroups. In fact I had rather assumed that progressive rock had gone into decline. Until a few weeks ago when I was asked if I would like to review a couple of CDs released on Moonjune Records for TNT-Audio. Having not heard much (any?) Italian rock music I was intrigued and as it turns out more than pleasently surprised. 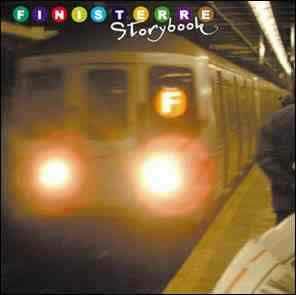 Finisterre was founded by guitarist Stefano Marelli and bassist Fabio Zuffanti and released their first album in 1995 with Boris Valle on keyboards ("Finisterre" on Mellow label). This was followed by "In Limine" and later "In Ogni Luogo" on the IrIdea label. "Storybook" is a recording of their first USA gig at the 1997 ProgDay open-air festival in North Carolina. The above named trio were joined by Andrea Orlando on drums and, critically in my view, Sergio Grazia playing flute. Firstly the CD is well recorded and conveys the feeling of the live performance. But it is the music that really impresses. These musicians are all very accomplished and what is more play with the integration of a good jazz combo, giving the soloists room to play without losing the flow of the song. The vocals of Zuffanti and Marelli are pleasant enough but not able to understand Italian did not hold my attention. The music reminded me of that great 70s band Focus and even Jethro Tull such is the prominance of the flute on many of the songs, the first track (In Limine) being one such example. The flautist is not a side show in Finisterre! The opening track is followed by a 15 minute opus which in parts is reminiscent of Marillion's Childhood's End. Other tracks on this Finisterre CD display Yes-like and a guitar-sound being a cross between Isotope (the acoustic passage on track 3 Hispanica and the distorted beginning of Altaloma) and Genesis. In fact Phaedra (track 7) contains a soaring guitar solo that includes a rendition of Hackett's solo towards the end of Firth of Forth on the Genesis landmark Selling England by the Pound. And the final track (Canto Antico) ends with guitar chords that sound like those found on Musical Box by Genesis. But don't let me give you the impression that Finisterre sound overall like any of these supergroups of past. No, whilst there are clearly influences from the 70s and 80s, Finisterre sounds fresh and has a character all its own. Swaying from the delicate Hispanica to the altogether heavier sound of Macinaaqua, Macinaluna.